Hadrian's Wall stretches from the Solway Firth to the River Tyne and for much of the Roman occupation of Britain formed the most northerly boundary of the greatest empire the world had ever seen. Many books have been written about Hadrian's Wall itself, about its history, its purpose, its architecture, its remarkable (if partial) survival, and about the Romans who built it and who lived and worked on and around it for not far short of three centuries. John Miles has produced a wonderful addition to any library about Hadrian's Wall with a book that looks at the natural history of the Wall and the areas it passes through. 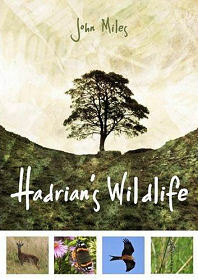 The author first came to the area in 1981 as warden of an RSPB reserve and seems uniquely qualified to fill in the gaps normally left by books with "Hadrian's Wall" in the title. The book starts with a chapter looking at bird life along the wall, both now and (from remains found in archaeological excavations) when the Romans were in occupation. It concludes with useful information about visitor centres; what to look out for along the wall on a month by month basis; and what the Romans made of British birdlife as a means of supplementing their diet. But by far the largest part of the book takes the reader on a fascinating journey along the Wall from west to east, taking each area in turn. The starting chapters look, for example, at the Solway Estuary; the Solway Mosses; and the Solway Marshes. For each area the author presents a general description, followed by a review of the landscape, the birds and the animals. What emerges is a series of well written pen-pictures that are likely to be enjoyed as much by general readers whose interest is primarily in Hadrian's Wall as by others with a particular interest in natural history. Some of the chapters look at obvious areas such as "The Crags", while others look at individual RSPB reserves on or near the Wall, as well as notable landscapes just a little further afield, such as Kielder. A nice surprise towards the end is the inclusion of "Kittiwake City", the world's only inland Kittiwake colony based in the centre of Newcastle, while space is also found to cover the early naturalist Thomas Bewick, a native of Tyneside.